When first asked to review this book, I thought it may be a dry and complex read and I, as a retired registered nurse, with no midwifery experience, would have little interest in the detail. How wrong I was. Complex it is, but dry and uninteresting, absolutely not. National Woman’s Hospital opened in 1939 with the egalitarian goal providing safe, pain-free, maternity services for all women, regardless of status or wealth. Its closure in 2004 was due to partly to an international trend to combine maternity services with large general hospitals to ensure quick access to specialist care, partly to its general run-down state, and partly due to its inability to move on from the adverse publicity of what is commonly known as the ‘unfortunate experiment’ – the Cartwright Inquiry into the treatment of women with cervical cancer at NWH. This book is the story of that journey. It is not only a history of the hospital, but also a history of New Zealand women, and the reproductive and social issues that loomed large in the women’s movements in this country throughout the twentieth century. Health historian Linda Bryder takes the reader through the history of childbirth services in New Zealand from 1900 to the present day, with meticulously annotated notes. It is a compelling journey, through the internationally acclaimed discoveries of Dr William Liley and Dr Graham Liggins, to the influence of the feminist movement in the 1970’s and 1980’s and the publicity of the Commission of Inquiry into cervical cancer trials, to the demise of the hospital. The politics of the hospital and its personnel are dealt with objectively, but the contemporary intrigue surrounding even distant events is still there. The Auckland Hospital Board was committed to providing a new maternity hospital in Auckland by 1939, with a doctor and a nurse for every confinement. The service was to be available to all mothers, and crucially, was to include reasonable pain relief as of right. The latter was a result of advocacy and pressure from the formidable National Society for Protection of Women and Children, and the National Council of Women, heralding the beginning of the active involvement and influence of women’s groups throughout the life of the hospital. NWH was set up to be a teaching, research and learning institution, under the control of the University, not the State, and was for both Obstetrics and Gynaecology. That specialisation quickly enabled it to build on its original aim of reducing the risk of maternal and infant mortality and improving the health of women and children. NWH went on on to become a major centre for, and international leader in, the care of premature babies. Amongst many outstanding contributions NWH made to world health, the breakthrough treatment of Rhesus factor babies in the 1960’s, and Liggins’ discovery of the use steroids in the prenatal premature baby in the 1970’s, stand out. Less obvious is the part NWH played in enabling the freedom of women to plan their lives, beginning with that crucial freedom freedom from the risk of maternal and infant mortality. Reproductive choices followed. A family planning clinic was set up in 1972 and performed sterilisation by tubal ligation at the hospital, and with the passing of the Contraception, Sterilisation and Abortion Act in 1977, abortions were performed at National Women’s. Bryder carefully and sensitively documents the challenges and ethical dilemmas these developments posed for certain medical staff. From there, she explores the challenges of the Feminist Movement and some the issues that arose for NWH as a result of new ideas and technologies that expanded opportunities and reshaped expectations for women. Radical feminists in the 1970’s and 1980’s took the view that men had no part in childbirth, for example, and questioned the motives of male obstetricians. Some midwives supported this view and became increasingly politicised during this time. However, the most suprising revelation for me was that the article by Bunkle and Coney in Metro magazine which exposed the ‘unfortunate experiment’ and eventually led to the Inquiry and subsequent disgrace of NWH, was actually based on their misunderstanding or misinterpretation of clinical data. It seems both ironic and unfortunate that the high ideals in setting up of the hospital, exemplified in the years from 1946 to the 1980’s under the leadership of Dr Harvey Carey and Dr Dennis Bonham, were brought down by erroneous information. The fallout was devastating for NWH and forced a transformation, not only of the hospital, but also more widely, prompting the legislation and practice that is now fundamental in protecting patient rights. 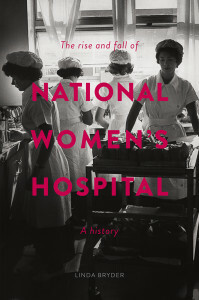 The Rise and Fall of National Women’s Hospital is a fascinating read, especially in the way it traced changing social, clinical and political trends and detailed the role of lobbying and politics in decision-making from before National Women’s Hospital was built to its eventual demise. I recommend it highly. Heather Clendon trained as a nurse at Wellington Hospital in the late 1950’s. Post graduation, she worked as a paediatric nurse at Wellington Hospital, before leaving to raise a family. She returned to nursing after 10 years, in both Wellington and Auckland. For the 15 years prior to her retirement, she was an Oncology nurse at Auckland Hospital. Where can I obtain a copy? please. I have been a patient at the Cornwall park hospital and a nurse at the new hospital.